After two and a half seasons in the minors, Mazeroski joined the Pittsburgh Pirates in 1956 where he remained a fixture in the Pirates infield for 17 years. At the age of 21, he was named to the first of seven All Star teams. Mazeroski was selected as Player of the Year in 1960 and the winner of the Babe Ruth Award as the outstanding player of the memorable 1960 World Series. He led off the bottom of the ninth in the seventh and deciding game with a home run to give the Pirates a 10-9 victory and the World Series championship over the New York Yankees. He won eight Gold Glove awards. Pittsburgh’s fans voted him the “greatest Pirate second basemen ever” and his World Series home run the “most memorable moment” in Pirates’ history. He was inducted into the Baseball Hall of Fame at Cooperstown in 2001. William Stanley Mazeroski was born in Wheeling, West Virginia, on September 5, 1936. Soon after, his father Lew, a coal miner, moved the family across the state line to southeastern Ohio. At Warren Consolidated High in Tiltonville, Ohio, Bill was an All-State basketball player for two years. He set a Class A record by scoring 553 points in his senior season. 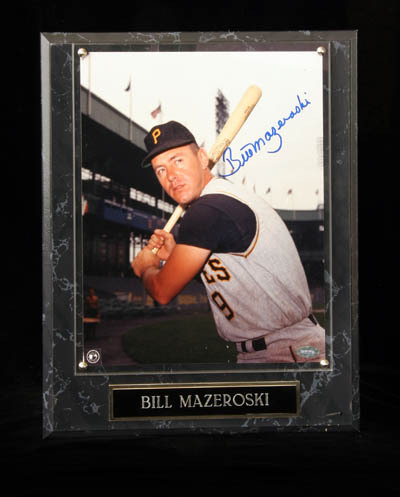 However, Lew Mazeroski and Bill’s high school coach, Al Burazio, had carefully chartered a baseball career for Bill. Coach Burazio took Bill to Pittsburgh and had him work out before club owner Branch Rickey, Sr. The move was a success as Bill was offered a bonus and signed a Williamsport Eastern League contract in June 1954, the initial step to Maz’s great career. After two and a half seasons in the minors, Mazeroski joined the Pirates in 1956 to become a fixture in Pittsburgh’s infield for 17 seasons. His infield style soon became the talk of the National League. At age 21, Bill was named to the NL All Star squad. When Mazeroski began taking infield practice before the 1958 All-Star Game at Baltimore, the American Leaguers stopped warming up and studied Bill in the same way the National Leaguers did when Ted Williams took swings in the batting cage. Mazeroski would be named to the National League All-Star team seven times. In 1960, he was named Major League Player of the Year by the Sporting News and won the Babe Ruth Award as the outstanding player in the World Series. His lead-off homer in the bottom of the ninth inning of the seventh game of the World Series ranks as one of baseball’s greatest moments. 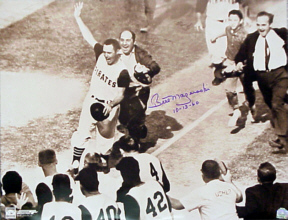 Mazeroski’s homer gave the Pirates a 10-9 win over the Yankees for the World Series Championship. Known as one of the game’s greatest defensive infielders, Mazeroski earned eight Gold Glove Awards during his career. Major league second baseman records he set and/or holds include: most double plays participated, season (161); most games, season (163); most years leading league in assists (9); most years leading league in double plays (8); most consecutive years leading league in double plays (8); most double plays, lifetime (1,706). Maz also set and/or holds several National League second baseman records: most years leading league, total chances accepted (8); most games, lifetime (2,904); most chances accepted, lifetime (11, 659); most putouts, lifetime (4,974); most assists, lifetime (6,685). The October 13, 1960 scene of joy shows Bill Mazeroski, cap in hand, waving and shouting victoriously, approaching home plate with a mob of happy teammates and fans awaiting to welcome him home. With the scored tied 9-9, Maz led off the bottom of the ninth inning in game seven of the World Series against the Yankees. He looked at ball one from pitcher Ralph Terry. On the next pitch, at 3:36 P.M., Maz slammed a home run over the left field wall to win the game 10-9 and earn the Pirates the 1960 World Series Championship.